Treating acne is quite difficult and treating acne scars is even much more difficult. However, there are some natural homemade face masks for acne scars and redness that will help you lighten the spots caused by acne at home. These homemade face masks are made from ingredients in the kitchen and they are also easy to follow at home. After getting pimple and acne, you will easily have ugly and stubborn acne scars. In fact, getting blur or deep scars depends on the type of your skin, the genetics and age. 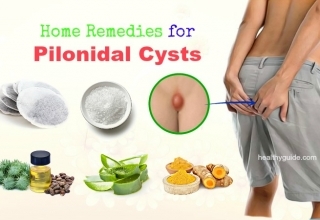 If you do not care for your acned skin properly, it will be able to cause keloid scars on your skin. When you have acne scars, it is sure that you will feel unconfident. Therefore, if you want these ugly scars to disappear in a short time, you need to carefully follow these skin care tips as I will reveal in this article and try to apply these natural recipes as soon as possible. Another one of the best homemade face masks for acne scars and redness that you should try at home is apple cider vinegar mask. This mask has 4 ingredients, including apple cider vinegar, honey, green tea and sugar. Apple cider vinegar has the alpha hydroxyl acids that can unclog the skin pores in order to remove the stuck bacteria, dirt and excess oil. Moreover, according to a study , it is also useful in restoring pH skin level, dealing with blemishes and closing the pores. Whereas, honey contains moisturizing, antibacterial, antiseptic properties and all of them make it become an ideal ingredient for acne scars. Also, honey can help deal with skin redness and inflammation caused by acne thanks to the anti-inflammatory properties found in honey. In terms of green tea, it is a good source of antioxidants, which can help you prevent harmful free radicals and simultaneously provide you with a bright, youthful and flawless skin. The last ingredient of this face mask is sugar and it has glycolic acid that can help in removing dead skin and enhancing cell renewal. You pour 1 tbsp. of the apple cider vinegar in a large bowl and add 2 tsp. of green tea into this bowl. Then, mix the solution with 5 tbsp. of sugar and 1 tsp. of honey. Stir all of the ingredients well until you get a thick consistent paste. Apply this paste onto your acne scars with a cotton pad. Gently massage it for several minutes for removing dead skin cells and increasing blood circulation to the skin. Leave it on for 15 minutes and then rinse your facial skin off using lukewarm water. Follow this face mask 1-2 times per week. Note: If there is not apple cider vinegar available, you can use lemon juice for the same effects. Read on 35 Best Ways On How To Exfoliate Skin Naturally At Home to know more about effective ways to exfoliate skin at home. When you are looking for the best homemade face masks for acne scars and redness, you should not look down this great mask. According to a research about avocado oil skin benefits , avocado has high content of vitamin C that helps stimulate the collagen production and improve the firmer skin. Also, it has natural anti-bacterial and anti-fungal properties, so it can help to prevent acne-causing bacteria. Whereas, anti-inflammatory properties found in honey can help in relieving inflammation, thus treating acne and pimples. Mix 2 mashed avocados, 1 tbsp. of raw honey and 1 tbsp. of cocoa powder in a bowl. Apply this mixture to your acne scars and leave it on there for about 20 minutes. Repeat this face mask at least once a week for visible results. List of Top 26 Best Tips On How To Lighten Skin At Home will help you know more about the natural treatments for lightening skin at home. Mix 1 tsp. of cinnamon powder and 2 tsp. of honey in a bowl and then mix them well. Wet your face with lukewarm water and then apply this mixture to your facial skin with the help of your fingertips. Leave it on for about 10-15 minutes prior to rinsing it off with warm water and following up with applying a toner. Thanks to its high content of lactic acid, raw milk can help in exfoliating the skin and giving it a younger look. On the other hands, according to a study about the ability of turmeric for acne treatments and scars removal , turmeric is well known for its ability to treat acne scars because it contains antioxidant, antibacterial and anti-inflammatory substances. You mix 1 tsp. of turmeric powder, 1 tsp. of honey and 2 tsp. of milk in a bowl until it becomes a smooth paste. Apply this paste on your acne scars and leave it on for about 10-15 minutes. Then, rinse it off with warm water. Repeat the use of this face mask several times per week for the best results. When it comes to natural face masks for acne scars and redness, you should not skip out baking soda, honey and coconut oil. You mix 1 tsp. of baking soda, 1 tbsp. of raw honey, 1 tsp. of coconut oil or olive oil together. Apply this paste over your facial skin, excluding your mouth, eyes and eyebrows. Massage it for 1-2 minutes in circular motions. Allow it to sit on for 10-15 minutes. While washing it off with lukewarm water, you can use a washcloth for additional exfoliating effects. Sandalwood contains antibacterial properties that may be effective in battling with fungi and bacteria that are one of the main causes of the acne and pimples. Mix 1 tsp. of rose water, 2-3 drops of lemon juice and 2 tbsp. of sandalwood powder in a bowl. Apply this paste on your acne scars and leave it on for around 15-20 minutes. Repeat this face mask 2-3 times per week. According to a study about benefits of gram flour in skin care , gram flour can help you exfoliate your dead skin, reduce the appearance of acne scars and brighten the skin. Therefore, it is also known as one of the common ingredients for natural face masks for acne scars and redness. Mix 2 tbsp. of gram flour, 1 tbsp. of buttermilk, 1 tbsp. of rosewater and 1 pinch of turmeric powder in a bowl to get a fine paste. Then, apply this face mask to your facial skin as a mask. Allow it to dry for several minutes and then wash it off with cold water. Repeat this natural treatment once a week for the best results. Orange peel contains retinol that supports the skin renewal. Plus, it can help to stimulate the collagen production and help to rebuild the fibers in the skin cells. So, you can say that orange peel is a great home remedy for treating acne and acne scars. Then, apply this paste on your acne scars and allow it to dry for around 15 minutes. Apply this face mask twice a week to get visible results. 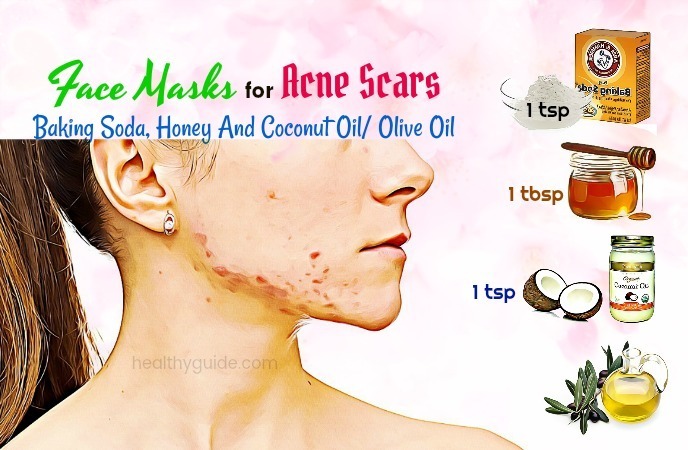 Actually, this is an excellent one on the list of homemade face masks for acne scars and redness that you should know and then try to apply, especially if you are looking for a natural remedy for your acne scars at home. Mix 2 tsp. of almond milk, 1 tsp. of lemon juice and 1 egg white and then apply this paste on the acne scars in circular movements, avoiding getting the paste into your eyes. Allow it to sit on for 10-15 minutes and then rinse it off with lukewarm water. After that, gently dry your facial skin with a clean towel and then apply a skin-whitening face cream. Repeat this face mask twice a week for visible results. Baking soda has anti-inflammatory properties that help reduce red marks and irritation caused by acne scars. Moreover, it also helps to encourage the production of collagen to fulfill the indented scars caused by acne and pimples. Plus, this ingredient will help to promote new skin growth. Mix 1 tbsp. of baking soda with 2 tbsp. of filtered water. Apply this mixture to your acne scars and leave it on for 2 minutes. Gently massage and then wash it off with fresh water. Repeat this process once a month to minimize the risk of developing deep acne scars. Do you want to discover other natural homemade face masks for acne scars and redness? Continue reading this entire article and then try to apply them for good. You peel and puree a cucumber and then add 1 tbsp. of yogurt to it. Then, you apply this cucumber mask to your face for 15 minutes. Finally, you wash it off with cold water. Add some drops of lemon juice and some 100% pure aloe vera gel to a blender. Blend for 1 minute and then apply this mask to your facial skin and allow it to sit there. After application of about 10-15 minutes, rinse it off with lukewarm water and then moisturize your facial skin with a moisturizer. Repeat use of this homemade face mask up to 3 days a week. This is another one of the most effective face masks for acne scars and redness that I want to reveal today. Acne scars can lead to rough and aged skin. And if you want to deal with this skin condition, you can consider applying one of the natural face masks for acne scars and redness with oatmeal, honey and lemon juice. This face mask recipe will help in cleaning your skin effectively, especially the sebum and dead skin cells will be removed. Also, this recipe will help in opening the skin pores and boosting up the skin renewal, thus helping to reduce scars caused by acne and pimples. In a small bowl, mix 2 tbsp. of oatmeal, ½ tbsp. of lemon juice, 2 tbsp. of raw honey and 4 drops of tea tree oil to get a paste. Apply this mixture to face as a face mask. Allow it to sit on for around 10-15 minutes. Remove this face mask with cold water and a washcloth. For the skin where acne scars are present, applying natural face masks regularly is considered as one of the best ways which is effective, safe, and easy to apply. 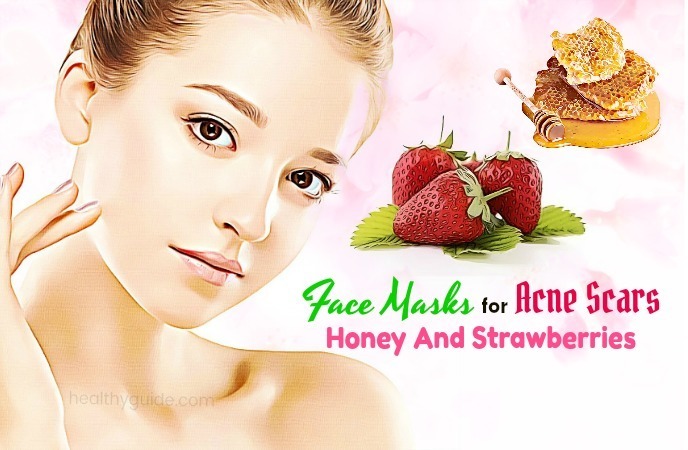 Among the face masks for acne scars, this mask recipe with lemon and honey is so popular. Clean the skin with acne scars with a lukewarm towel so that the pores can be expanded and the skin can absorb more nutrients from the lemon andhoney. Then, apply a thin layer of this mixture onto your scarring skin area. Gently massage the skin for about half an hour. Actually, this face mask is one of the best face masks for acne scars that you should know and then try to apply at home. Moreover, it is also safe and easy-to-make, so you should not hesitate when following it at home right now. Tomato is not only good for human health and weight loss, but it also contains many essential vitamins and antioxidants that are especially good for the skin health. On the other hand, potato is a great source of starch that is good for health and it is also a skin-whitening ingredient found in a plenty of beauty recipes. 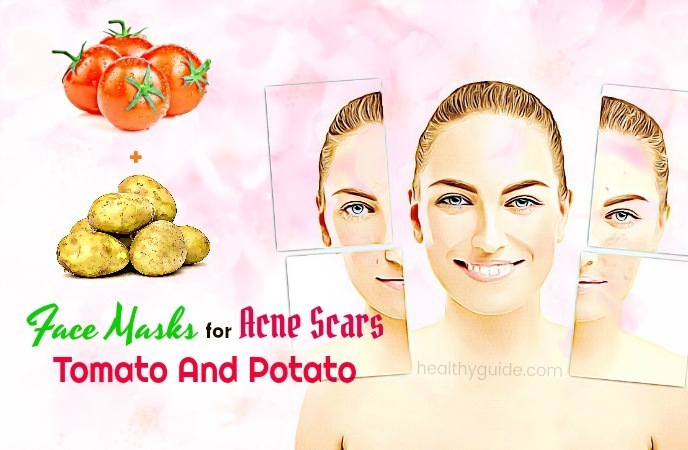 So, with the combination of some tomatoes and potatoes, I believe that you will have a lightening mask that can help you blow out acne scars naturally and effectively. Simply, you just need to steam a small potato, put this steamed potato into a mixer and puree it with a peeled and seeded tomato. You can try adding some olive oil and mix them well. Then, apply this mixture onto your acne scars, leave it on for about 20 minutes, and then wash it off with lukewarm water. Repeat this process regularly and you will see your acne scars faded quickly. Actually, this is also one of the most effective face masks for acne scars that you should not skip out, yet apply it regularly for good. Both avocado and banana contain many essential vitamins and minerals that can help to regenerate the skin, make it soft, and lighten it naturally and effectively. To make this face mask at home, you just need to put the avocado, banana, and peeled, seeded tomato into the blender to puree all of the ingredients together. You can mix it with some pure honey or olive oil for the better efficiency. After you wash your facial skin clean, evenly apply this mixture onto your skin. Leave it on for about 20-30 minutes prior to rinsing it off with lukewarm water. In fact, not only effective in fading out scars caused by acne and pimples, this natural face mask can also help in lightening and moisturizing the skin gently. So, you can say that this is one of the best natural face masks for acne scars that you should try out. This is another one of natural face masks for acne scars you should make at home to remove your acne scars naturally. And this mask recipe just includes natural ingredients such as tomato, rice bran and fresh milk. In fact, rice bran and milk are benign, and they can provide enough nutrients to make the skin soft, radiant. Simultaneously, they can also help in removing acne scars when mixing with tomatoes. Simply, puree a tomato with about 150 ml yogurt, add some rice bran to get a mixture and then apply it onto your facial skin. If you are worried that this mask can stick to your clothes, apply this mixture onto a paper mask and then apply it to your face. Wait for about 20 minutes until this mask becomes dry, remove it from your face and finally wash it off with cool water. Cinnamon has been used as an anti-viral and anti-fungal. It contains anti-microbial activity that may help lower the risk of diseases due to bacteria. Besides, it has some powerful antioxidant properties, so it helps to stop premature destruction of healthy skin cells. Nutmeg is known as an anti-inflammatory and it will help your scars caused by acne disappear. In fact, nutmeg has been used to heal some skin diseases such as eczema and ringworm. Nugmeg is high in vitamin C, vitamin A, folic acid, niacin, riboflavin and flavonoid antioxidants. Addition to this, honey is an antibacterial and anti-fungal property and aids to disinfect and boost the healing process of acne scars. Lemon juice is packed with vitamin C and helps to build the collagen. Lemon will lighten blemishes, scars or dark spots. You mix ½ tsp. of organic cinnamon, ½ tsp. of nutmeg, 1 tsp. of raw honey and 2 tsp. of lemon juice to create a thick paste. Wash it off with lukewarm water and then apply your moisturizer. Note: If you have sensitive skin, dilute or skip out the lemon juice and instead, add a bit more honey. Repeat this mask 3 times a week if you want to reduce acne scars, reduce uneven skin tones and reduce pore size. This mask will work gradually and if you are consistent with using it twice a week, you will notice a huge improvement on your skin soon. When it comes to face masks for acne scars, you should not skip out the face mask with turmeric, Greek yogurt and honey. Mix 1 tsp. of turmeric, 3 tsp. of full-fat, unflavored Greek yogurt and 1 tsp. of raw honey. Apply this paste over your facial skin, excluding the mouth, eyes and eyebrows. Tip: You can use cotton balls or a makeup brush to apply this paste and to prevent it from staining your fingers. Leave this face mask on for about 10-15 minutes. Then, you remove this face mask with a washcloth or cotton ball. If a yellow tint remains, you can remove it with apple cider vinegar diluted in water or toner. There are some other face masks for acne scars in this article. Continue reading to discover them! 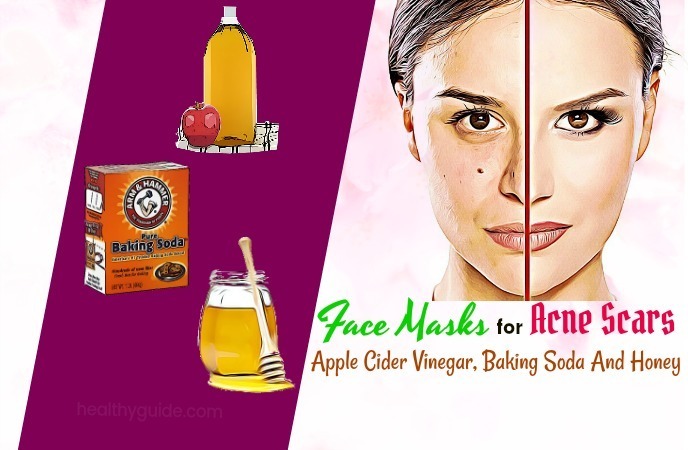 Another one on the list of face masks for acne scars that you should not look down, but try to apply at home is a face mask that is made from apple cider vinegar, baking soda and honey. You mix 1 tsp. of apple cider vinegar, 2 tsp. of raw honey and 1 tsp. of baking soda together. Let this mask sit on there for 10-15 minutes. Rinse it off with warm water using a washcloth for exfoliating effects. This is actually one among face masks for acne scars that you should know. Hope that this face mask is effective in helping you treat your acne scars at home! This face mask is also on the list of face masks for acne scars that you should not skip out, especially if you are trying to deal with your acne scars at home. You mix 1tsp, of cinnamon, 3 tsp. of raw honey and 2 tsp. of aloe vera juice together. Massage for 1 minute in circular movements. Allow it to sit on for 10 minutes. Note: This face mask is really good for treating blackheads. If your skin is sensitive, do not use it. If you feel a burning sensation, wash it off immediately. Another one of the face masks for acne scars that you should know must include the face mask with honey, papaya, lemon juice and coconut oil or olive oil. You mix 2 tbsp. of mashed papaya, 1 tsp. of lemon juice, 1 tsp. of raw honey, 1 tsp. of coconut oil or olive oil. Apply this paste over your facial skin. Leave it on for about 10-15 minutes. While rinsing it off with lukewarm water, you can use a washcloth. Coconut oil is well-known for its beneficial properties and it is also effective in treating skin redness. Its moisturizing and anti-inflammatory properties, mixed with oatmeal may make it become a great mask for treating the skin redness that is caused by acne or some other irritants. Simply, you mix 1 tbsp. of oatmeal with 1 tbsp. of coconut oil. Then, apply it to the red skin areas and then allow it to sit on for about 20 minutes. Finally, wash it off and apply your moisturizer. Aspirin contains salicylic acid and it is good for reducing the skin redness and inflammation. To make a mask with aspirin, you crush a ½ aspirin and then add several drops of water to it in order to create a paste. Apply this paste on your face and leave it on for up to about 30 minutes. Wash it off and then pat it dry. This is the last but very common one on the list of natural face masks for acne scars that you should now and then follow at home for good. You mash 3 strawberries and 2 tsp. of raw honey. Mix them well and apply this face mask to your facial skin. Allow it to sit on for about 20 minutes. Wash it off with lukewarm water and then apply your moisturizer. Repeat this mask twice a week to get the best results. 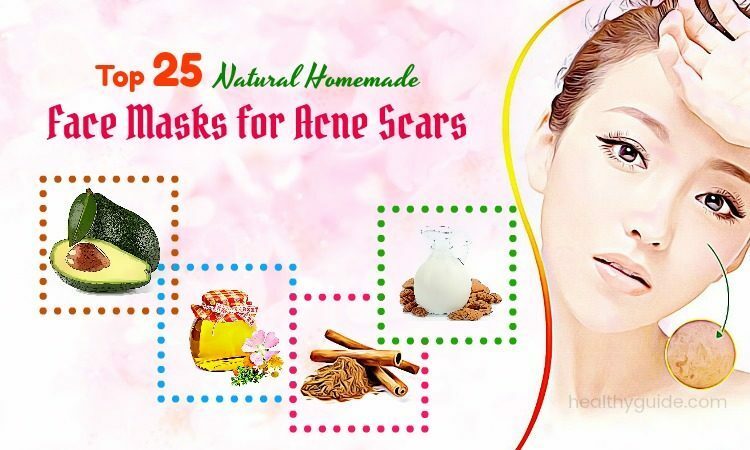 This is the list of 25 best face masks for acne scars so that the readers of Healthy Guide and other people who are trying to hide ugly and stubborn acne scars within a very short time period should read and consider applying as soon as possible. 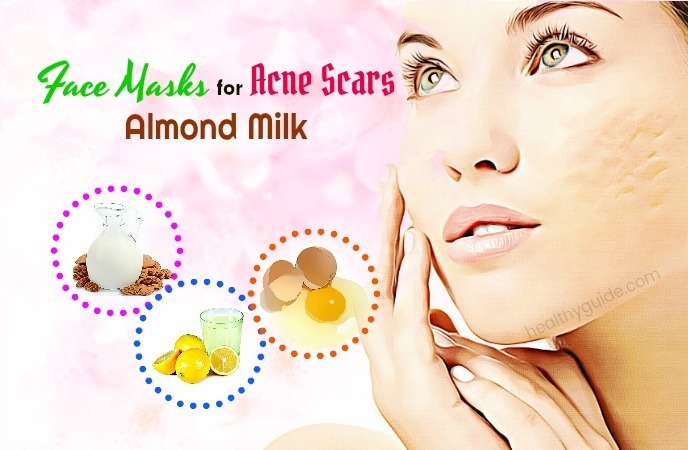 If you think that these face masks for acne scars mentioned in this post are very effective in treating acne scars naturally without using any medical solutions or cosmetic products, feel free to apply them and remember to share them with other people. If you know other face masks for acne scars, share them with us by leaving your comments below. Love this! Although I am a man, I am really scared of dealing with acnes and clearing the scars caused by acnes. Acne scars are usually very stubborn and cannot be faded easily; normally after a long long time (weeks or even months). Now with the tips and techniques shared in this article, I can be confident again! Thanks a lot for sharing such wonderful experiences and put them into a comprehensive article! This article is really wonderful for me and my current acne scar case! I have many scars due to acne after a long time suffering from acne breakout and they really bore me a lot. After start applying some of the simple natural remedies guided on this article, I really found some positive improvements on my facial skin. Amazing! Such a gift! Wish you the best and thank you a lot!